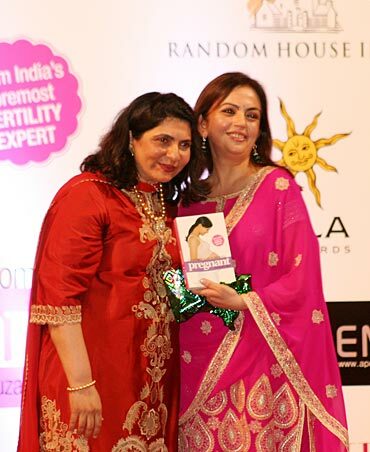 At the launch of fertility specialist Dr Firuza Parikh's book The Complete Guide to Becoming Pregnant, movie director Farah Khan said that the key to becoming pregnant is to be determined -- and not complain. Aamir Khan steps out of the the University of Mumbai's convocation hall looking for what most men seek out after an hour and a half in an air-conditioned room -- a restroom. But superstardom, as Khan would know, comes with restrictions. As he tries to make his way to a public loo next to the hall, the media -- photographers and camerapersons -- seems keen on following him in there too! Khan is at the university to attend a book launch. A huge neon photograph of a pregnant woman announces the title -- The Complete guide to Becoming Pregnant by Dr Firuza R Parikh. Parikh is India's foremost fertility expert, practicing out of Mumbai's plush Jaslok Hospital. She has been a source of hope for many childless couples, from plush Mumbai homes to poor Kashmiri families in the Valley. The event is clearly high profile. Mukesh, Nita and Kokilaben Ambani have made their presence felt -- they count the Parikhs among their closest friends and the Ambani couple are godparents to the Parikhs' children. 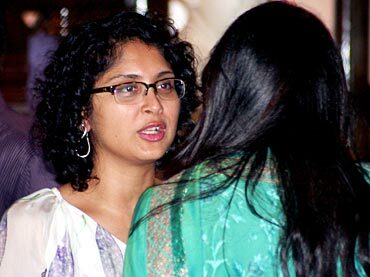 Later, filmmaker Vidhu Vinod Chopra, his wife and movie critic Anupama Chopra troop in too, as do Kiran Rao and columnists Shobhaa De and Malvika Sangvhi. 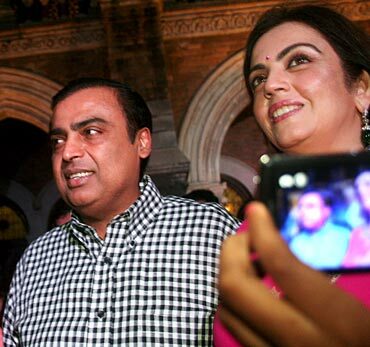 Ambani looks quite at ease as he walks by wearing a simple black and white checkered shirt, as does Nita, who wears a pink salwar kameez. The event, unlike most others in India, starts pretty much on time, with Nita introducing the author and releasing the book. Publisher Chiki Sarkar, dressed in a black cotton dress, also speaks briefly and mentions how pleasantly surprised she was to see Dr Parikh shedding light on a topic as serious as IVF by speaking of sperms being in an Olympic race and how the winner ends up being beheaded! Sarkar also talks of the time she flew down to Mumbai to persuade Dr Parikh not to give up on the book and convinced her of its relevance. 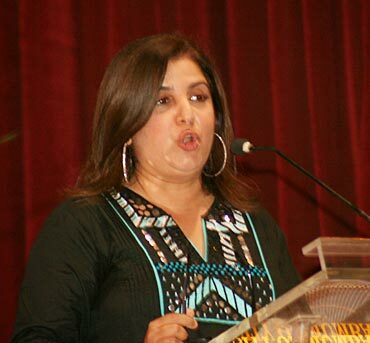 Also present at the event and discussing the book along with Aamir Khan is Bollywood movie director Farah Khan. Farah has undergone In vitro fertilisation (IVF) under Dr Parikh's supervision and says that she owes her triplets to the expert. The filmmaker has the audience in splits as she confesses that she was overwhelmed to be in the university's convocation hall "because I almost never completed my graduation!" Farah has written a chapter in the book, where she describes her IVF experience. Later, she leaves the audience in a bit of a shock when she decides to share intimate details. "I was so determined to have babies that one night I threw away my sanitary pads, saying I wouldn't need them again for the next nine months," she says. Responding to Aamir Khan's question about what women undergoing IVF should remember, Farah makes what is perhaps the most relevant point of the evening. She stresses on the importance of positive thinking. "You cannot complain about how many (hormone) injections we have to take. 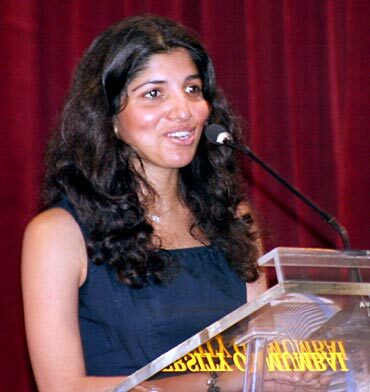 She (Dr Parikh) isn't asking you to climb Mt Everest every day." "Unfortunately, there are no pills right now, so the best way of conceiving is taking these injections," she says. Dr Parikh also seconds Farah's point when she responds to Chiki Sarkar's question. "We can see the determination and the calmness in a patient and figure out whether or not they are determined to have a baby," she reveals. Dr Parikh also adds that couples with high stress levels have lower chances of having a baby and higher chances of miscarriage. When the floor is thrown open for questions, Nita Ambani -- a family friend of the Parikhs for over 25 years -- makes it a point to ask the expert about her work in Kashmir, which she visits every fortnight. Dr Parikh reveals that she decided to start visiting Kashmir because she had noticed a lot of her patients were coming from there. "As a place, I find Kashmir is very close to my mind and heart. It is a neglected area. We've seen that the women there go into premature menopause. Girls as young as 13 never see a period!" she says. "Once there was a case of a woman who married at 22 and she stopped menstruating and thought she was pregnant. When we examined her four months into her 'pregnancy' we discovered that she was in menopause. How do you tell a young bride who is three months into her marriage that she cannot have a baby! That was also the time when I decided that this was an area where I have to invest my time and effort," she adds. Dr Parikh says that the exact reason for this (premature menopause amongst Kashmiri women) is not known. She speculates that it could be a result of stress because of the constant socio-cultural tensions in the area. She also adds that the problem is probably related to iodine deficiency, which creates antibodies that affect the ovaries and cause defects in the x chromosome. Responding to yet another question, Dr Parikh says that women taking oral contraceptive pills as well as the 72-hour emergency pills for a long time do have good chances of getting pregnant again. "There are a lot of studies that suggest that one can continue to take birth control pills safely for 3-5 years without any adverse effect. However once you stop these pills you have to wait for at least two months before trying for a baby. The emergency pill acts as antiprogesterone only for that particular cycle, so on a larger level it doesn't affect a woman's cycle," she says. However, Dr Parikh does warn against the voluntary termination of a pregnancy. Dr Parikh says, "If the termination isn't done properly, it can lead to blockage of the fallopian tube. So many women we've come across regret it because sometimes the tube is irreversibly blocked and damaged." Responding to yet another query, Dr Parikh adds that the IVF process is not foolproof and that if a couple is unable to conceive, they must look at other options such as adoption. 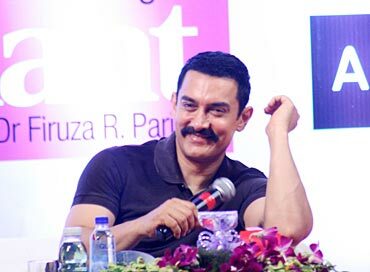 The event draws to a close as scheduled, with Aamir Khan concluding the discussion and thanking everyone. However, just as everyone is about to leave, Bollywood filmmaker Vidhu Vinod Chopra, who has been quiet all along, insists on having the last word. He asks Dr Parikh the secret of her humility. Not one to lose out on an opportunity, Aamir Khan promptly takes a dig at Chopra (who also produced his last blockbuster 3 Idiots). "Please answer that," he tells Dr Parikh, tongue firmly in cheek, "Because Vinod really needs an answer to it!" Chuckling, we walk out of the auditorium. Meet the Indians behind Intel's fastest processor! Cancer: How much do you REALLY know?